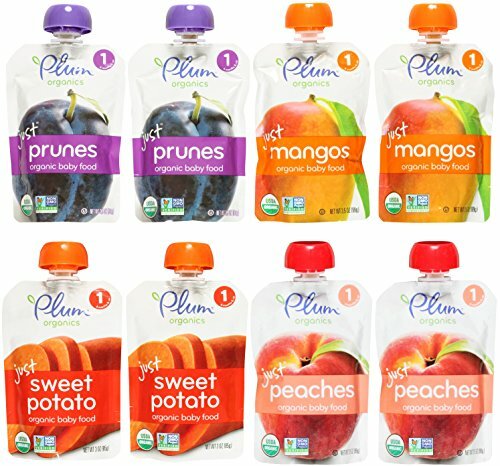 Plum Organics baby food is a delicious and nutritious way for your baby to satisfy his or her hungry little tummy. All pouches are non-BPA and contain only the best organic ingredients for your child. This bundle includes: (2) Plum Organics Stage 1 Just Prunes 3.5oz, (2) Just Mangos 3.5oz, (2) Just Sweet Potato 3oz, and (2) Just Peaches 3.5oz. There are 8 total pouches in this bundle. Plum Organics Stage 1 baby food is suitable for children from 4 months and older. Put a smile on your baby's face and buy these yummy organic baby food pouches today!